Kenya’s brief winter is all but over, now we eagerly await the ‘short rains’ to quench her thirst. It was during a sun-baked afternoon in October that I was invited to the Mau Forest by staff from the Center for International Forestry Research (CIFOR) and the Green Belt Movement (GBM). They were eager for me to meet members of the Itare Water Resource Users Association (WRUA) and the district’s Community Forest Association (CFA) at a seedling nursery built into a small clearing on the west side of the forest. We arrived early with the sun rising quickly in the sky. Shards of white light pierced through small holes in the forest canopy. Excited WRUA members led us down a narrow path to a nursery where dozens of women, men and children were hunched over piles of damp red earth which they packed into small black potting bags, donated by CIFOR and GBM. These two organizations recently engaged WRUA and CFA in a training session as part of CIFOR’s ‘Water Towers Project’. The project aims at pulling together water and forestry resources and governance, which traditionally act as separate entities. CIFOR’s research suggests that more collaboration between these groups would lead to better conservation and rehabilitation of Kenya’s forests. Teresa Muthoni, a Senior Program Officer from GBM led the training. She told me that in the weeks since then, the community groups had begun collecting indigenous seeds and identifying planting sites in the Mau Forest and river catchment areas: “After the training they told us that they want to start a tree nursery for diverse and indigenous trees, they were able to mobilize others and also to train others to participate”. This is a promising outcome that suggests the groups see strength and opportunity in collaboration. “They have to work mutually, for mutual interests, for mutual benefit for the betterment of conservation forever”, explained Koros Kiprono William, WRUA Chairman for Itare Chemosit, as he guided me through the nursery, introducing me to members of the community groups. Koros and I sat with a group of three elderly women from the Ogiek Minority Group, who live in the forest. Sarah Soi told me about the livelihoods of people living in the forest: “We have come here to learn the modern ways of conservation so we can incorporate it with our indigenous knowledge. We also need the livelihoods of bee keeping and sheep rearing, that is what we use to feed our children. Wildlife, animals — they are part and parcel of us”. Ester Kosgei began talking through bursts of hysterical laughter. She said, “My breasts are shrivelled and my eyes are a mess, but I walked through the night to be here with my friends, to help the forest, because the forest is everything to us”. The other women began laughing too. Everybody seemed so proud to show off the work they were doing. I asked Teresa from GBM whether she was happy with the turnout. She said that it was great to see so much age and gender diversity. Of the 30 or so people in the nursery, it was pretty much half-and-half male and female of all ages from children to the elderly, a real cross-section of the forest community. She explained to me that deep-seated nature patriarchal structures often make it difficult to reach all members of the community. “I realize women are doing more than men in terms of nursery management, so I think it will not be difficult to go to the next level of organizing a gender integration training whereby we will train some of the men and women as gender trainers,” Teresa added. After showing us the nursery, Stephen Kenduiwo, an Itare Conservation Group member led us further into the forest in search of indigenous seeds. The forest felt ancient and no two trees seemed the same. It was a stark contrast to the thousands of acres of tea plantations and eucalyptus trees that stand side by side in identical rows on the outskirts of the forest. “We are ready, willing and able to collaborate in terms of conservation and livelihoods, starting from this activity of planting indigenous tree seedlings with the aim of future rehabilitation of the rivers and degraded areas of the forest,” added Stephen as we clambered over roots and between branches with the hot, humid air sitting heavy around us. The last activity was to assess the site where the community groups planned to plant the thousands of seedlings being cultivated in the nursery. We drove deeper into the forest to where a bridge crossed a bend in the river, where the brown, earthy water gave way to torrents of white rapids smashing over rocks. On the other side of the waterfall was a green clearing where some cattle were grazing. This was the proposed site. Teresa walked across the clearing making a mental note of its pros and cons. When I asked what she thought of the site, she said: “It’s good because there is a school near, so the kids can also interact with the trees. It’s next to the river so the Water Resource Users will see sense in planting trees here and the CFA will also see sense in planting because it is inside the forest”. As we began the long drive back to Nairobi, I thought back to June and start of the winter when I had covered the launch of CIFOR’s Water Towers Project. It was great to see that in just four months the project was having such a direct impact. I looked out of the window at a seemingly endless landscape of tea and eucalyptus trees. Then I thought with hope of the WRUA and CFA members and the thousands of diverse and indigenous seedlings they are cultivating in that small clearing in the forest. I put on my headphones and listened to the interviews I had recorded in the nursery. “I know that when I become old, I will be a parent with children and they will get that legacy that we are planting today,” said Evana Langat, aged 17. 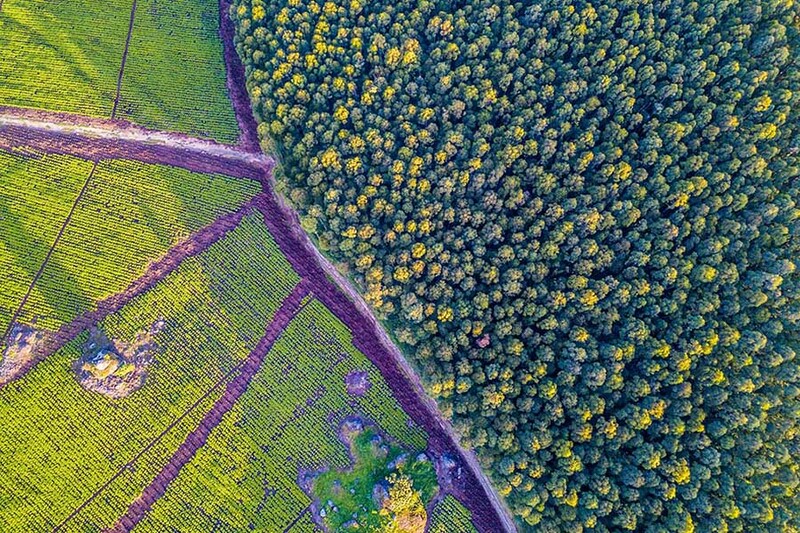 This research was supported by the German Federal Ministry for Economic Cooperation and Development (BMZ), GIZ Advisory Service on Agricultural Research for Development (BEAF) and the CGIAR Research Program on Forests, Trees and Agroforestry (FTA).